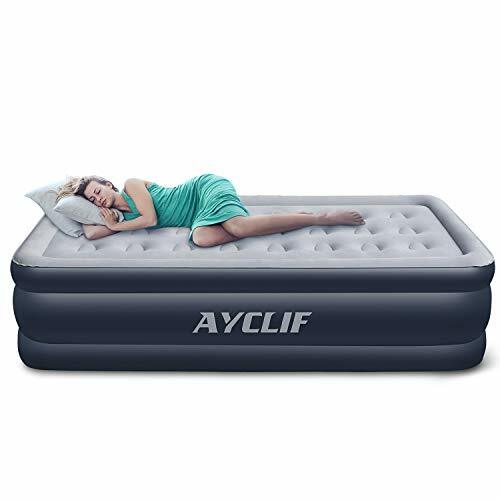 COMFORTABLY SOFT & HIGH QUALITY MATERALS: The AYCLIF Air Mattress comes with a 1 - Year Guarantee! - Composed of an extra thick, non-toxic, 0.5mm PVC and 0.2mm flocked top, this Air Mattress is hypoallergenic for even the most sensitive skin. Enjoy a deep, uninterrupted sleep that feels like you're resting on a regular mattress! STABLE & SILENT: Complete with a honeycomb structure and puncture-resistant materials, this air mattress will continue to maintain its form and firmness. Air is distributed easily throughout the entire mattress with the help of our special multi-chamber, multi-layer design to help reduce stress and pressure on your body. Supports up to 660lbs. Worried about waking others up in the middle of the night? High Quality PVC and a flocked top prevent irritating noises from movement. CONVENIENT & EASY TO STORE: Comes with a high-powered, built in electric pump for hassle free inflation and deflation. Can be charged at home before a big trip, or with a car charger on the road; Inflation and Deflation time take about 5 minutes each. Smallest deflated size comes to about 13"*8"*13.5" (L*W*H), so you can easily store the mattress in a carry-on, luggage, or to simply store away for future use. NO LEAKS: Upgraded seams and superior crafting make this air mattress completely air tight and leak resistant. The multi-chamber, multi-layer design helps prevent the air mattress from sinking or bulging. Firmness is adjustable according to your needs. MULTI-PURPOSE: Ideal for both indoor and outdoor use, this temporary bed will help make camping, moving, traveling, or sleepovers a cinch. 2*Repair patches included can prevent accidental damage to the mattress. 1-year warranty and lifetime support provided by AYCLIF.